At 1st glance, I was wondering whether this is food or toy (shown above) when i was airborning over kilian-nakamura but in a very short time it is a 100% food and edible like any normal food stuff. 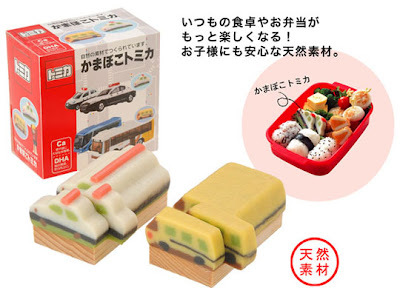 "Traditional fish cake manufacturer Odawara Kanko and toy maker Takara Tomy have teamed up to create Tomy Car Kamaboko, in the shape of the iconic model toy car". Look likes meals these day is getting their own iconic pimp up version and plus it is sold at "Odawara area souvenir stores as popular souvenir or gift and available online for ¥680 ($6.40) only" at Japan.I wonder will they release a C4 version too?